But, how do you know when a cough is something more serious? To help, here are six types of coughs to watch for. If your child has a “weak hoarse cough,” along with muscle aches, sniffles and high fever—and is just too wiped out to play—your child may have influenza, which we typically call the flu. Maybe he or she didn’t get a flu shot (more on that subject) or maybe the flu developed even with the shot (it can happen). This well may be croup cough, and we recently did a deep dive on that kind of cough. Croup is usually caused by a viral infection, but there is another type that’s a bacterial infection. Other symptoms may include a runny nose, wheezing, and hoarseness. The barky cough may turn into a harsh wheezing sound, called stridor. If that happens, contact your doctor, ASAP. Mild croup, though, can typically be treated at home. Give your child plenty to drink and allow him or her to rest as much as possible. Cough medicines don’t usually help croup cough, but you may want to ask your doctor about using Tylenol, Advil or Motrin to reduce fever and to help relieve chest discomfort. If this comes and goes, worse at night and when your child is running around, Parents.com says, this may be asthma. In this chronic condition, lung airways become narrowed and inflamed, creating too much mucus. 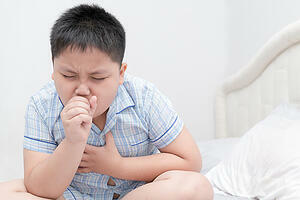 Your child may have asthma even if he or she never wheezes; the only symptom may be this hacking type of cough. If your child is thin or young, you may witness his or her chest cave in while breathing. If you suspect asthma, see your doctor, who can test lung function by a pretty simple test where your child would blow into a special tube. If your child has significant difficulty breathing, or struggles to speak, drink or eat, call 911. NortonChildrens.com shares that a wheezy cough, or one that’s raspy or gurgly, could be an infection called respiratory syncytial virus (RSV). This viral infection typically happens in the winter months and usually goes away on its own, but the article suggests that you call the doctor, anyhow. If your child struggles to breathe, get help immediately. Like with other kinds of coughs, plenty of rest and fluids, plus a cool-mist humidifier, can help with the symptoms of this respiratory infection. Known as pertussis, whooping cough because pretty rare because of vaccines introduced in the 1940s. But, in 2012 alone, there were more than 48,000 reported cases—the highest known rate, according to the Centers of Disease Control and Prevention (CDC), since 1955. Health.com lists the following initial symptoms: “stuffy, runny nose, watery eyes, fever, and cough.” But, within a week or so, people with whooping cough can hack so deeply that he or she may turn red or blue, or throw up. Your child will need to see a doctor to get diagnosed, because that takes a chest x-ray and blood tests. The treatment is antibiotics. If your child suddenly starts to cough, it’s possible that he or she swallowed food or liquid in a way that caused it to go into the airway. Or, food or a small object, or even vomit, can be caught in the airway or throat. Sometimes, the cough clears up the problem all by itself but, if it doesn’t—or if your child has difficulty breathing—call the doctor immediately. Don’t try to use your finger to clear out what’s lodged, ChildrensHospital.org says, because you could push the problematic object even further down the windpipe.